PEEPs is the smart start to an award-winning experience. 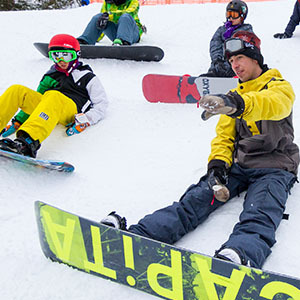 Earn your PEEPs Pass right here as you learn about terrain parks, their associated risks and proper terrain park etiquette. These fundamental principles are essential to an awesome park experience here at Brighton- and terrain parks everywhere. 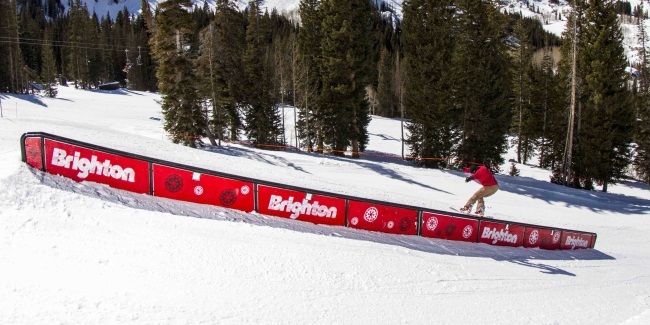 Home to a full progression of award-winning terrain parks, Brighton Resort offers features for all ages and abilities. 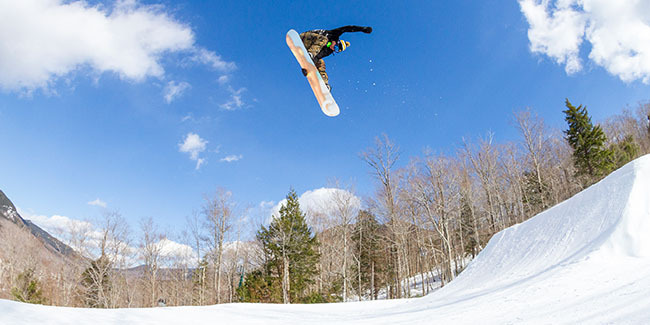 Jumps, hits, ramps, banks, boxes, jibs, rails, half pipes, quarter pipes, snow-cross, bump terrain and other constructed or natural terrain features. 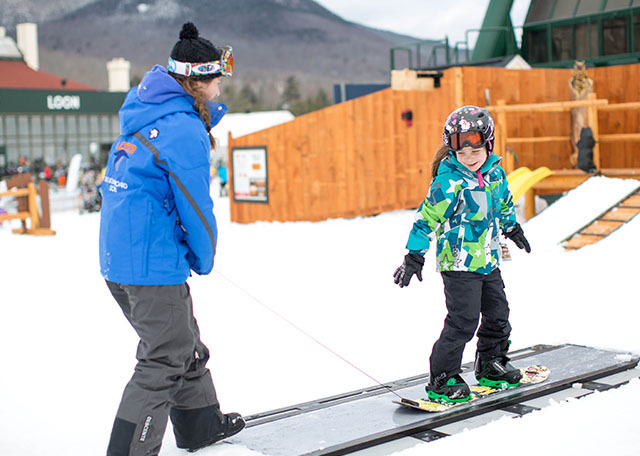 PRIOR to using Freestyle Terrain, you are responsible for familiarizing yourself with Freestyle Terrain and obeying all instructions, warnings and signs. Freestyle skills require maintaining control on the ground, and in the air. Your condition, speed, balance, body movements, alignment to the feature, trajectory, and maneuver will directly affect your desired outcome. Like elsewhere on the mountain the use of freestyle terrain, exposes you to the risk of serious injury or death. Always remember to look before you drop into a feature and warm up on smaller features. This symbol identifies areas on a ski resort that may have freestyle terrain. 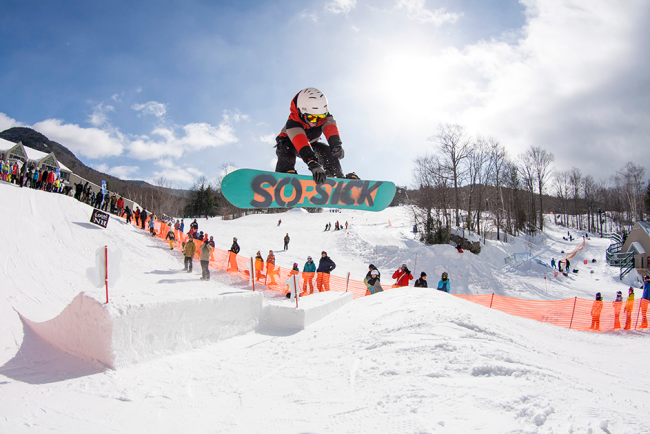 Signs containing this orange oval are located at the entrance to terrain parks around the resort. 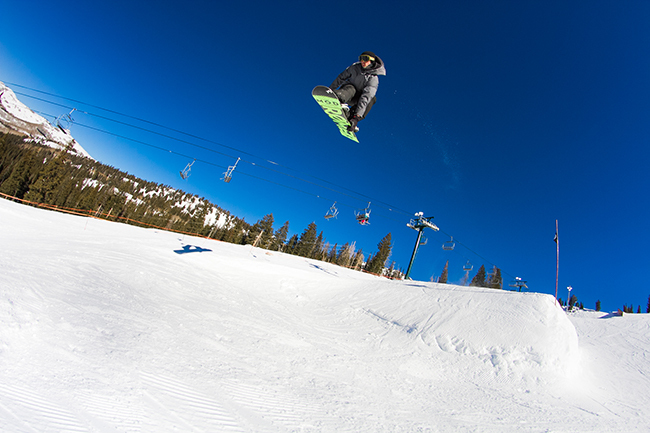 A Terrain Park is a designated area of a ski resort that contains natural and/or manmade freestyle terrain features, such as jumps and jibs. 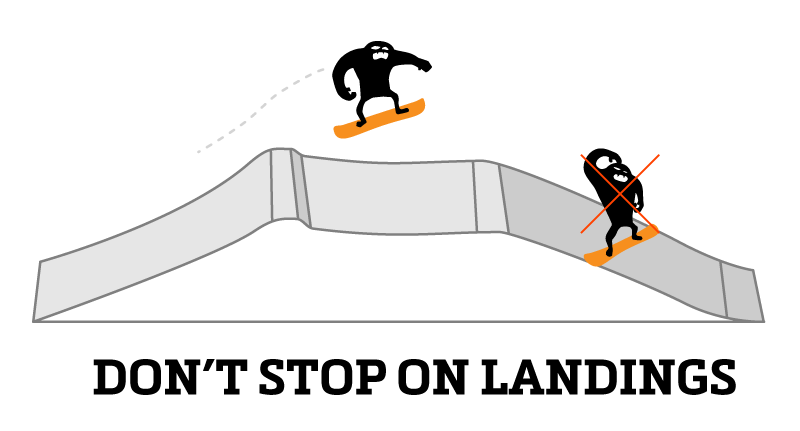 This is the symbol for freestyle terrain. 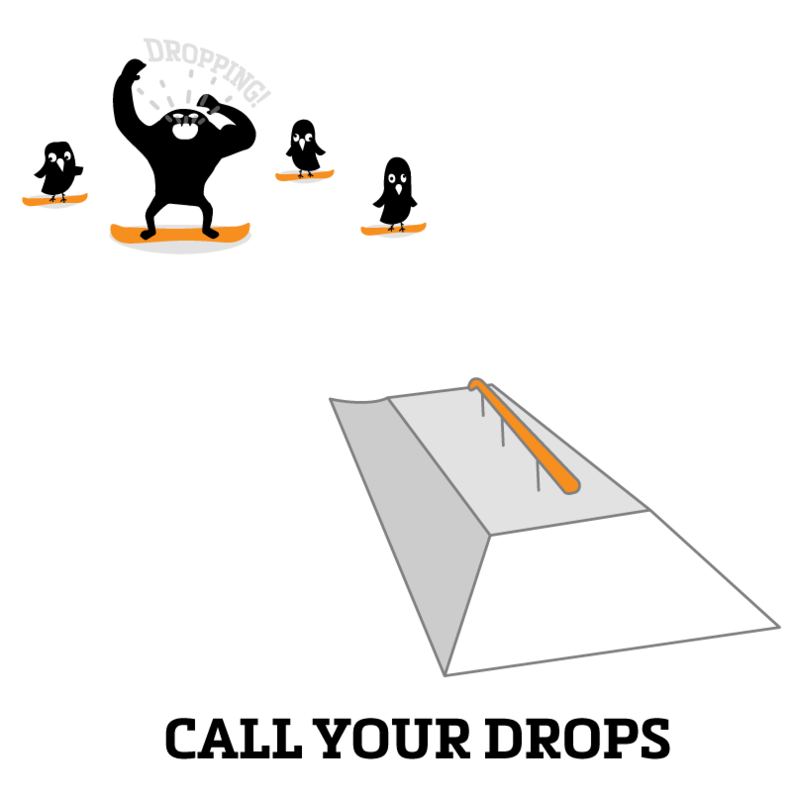 This orange oval symbol designates freestyle terrain such as parks and pipes. 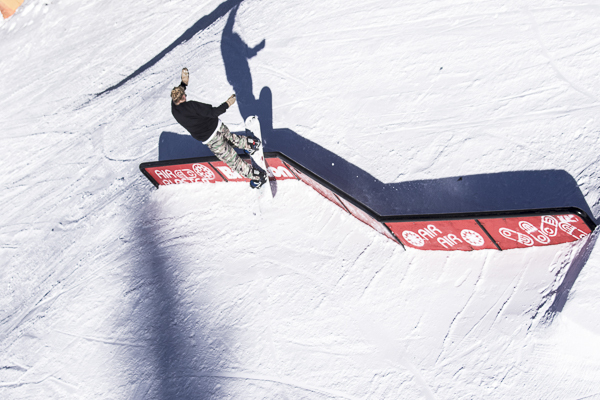 Spot this symbol around the resort and expect freestyle terrain ahead. 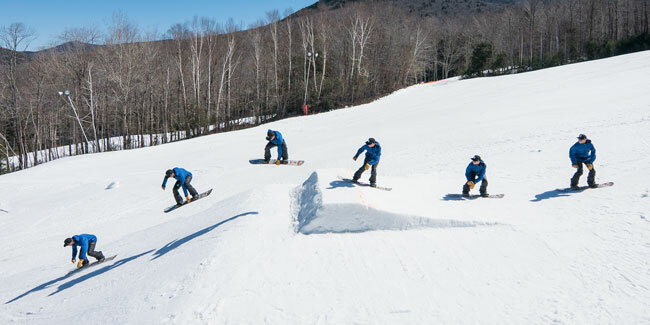 Our resort designate terrain parks as either X-Small (XS), Small (S), Medium (M), or Large (L), due to the size of the freestyle terrain features found within them. 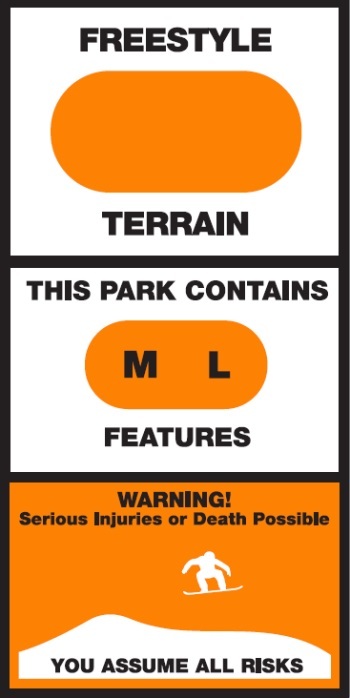 This designation indicates the size of the largest features you will experience while within that terrain park. 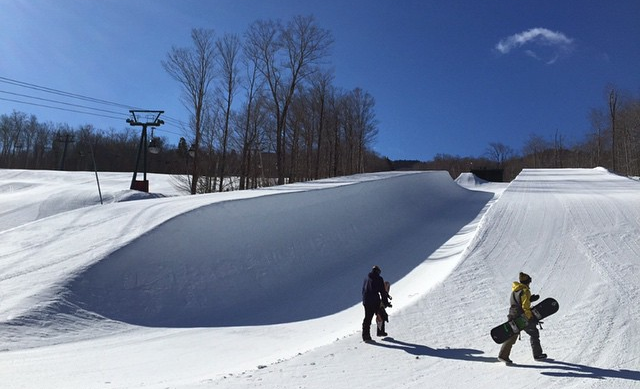 Keep in mind you may encounter features that are smaller in size due to feature progression and flow within our terrain parks. 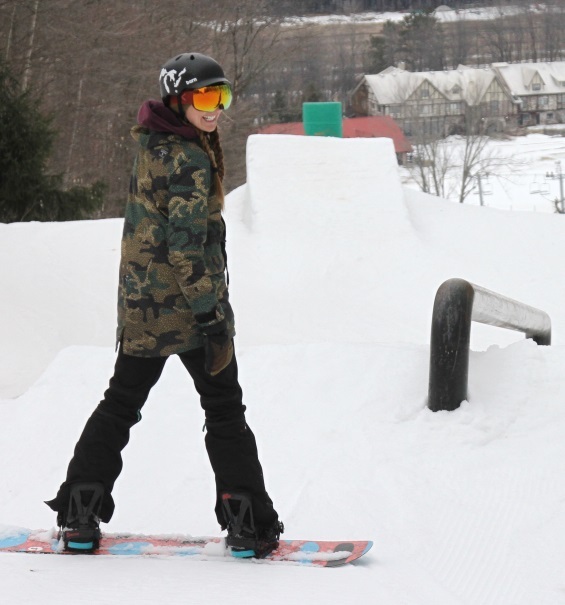 At the terrain park entrance, you will find signage that designates size. Beware these ratings are determined by size, not degree of difficulty, and are relative only to the resort you are currently visiting. We recommend you start with the smallest park and work your way up. What does the orange oval stand for? These are some types of freestyle terrain? 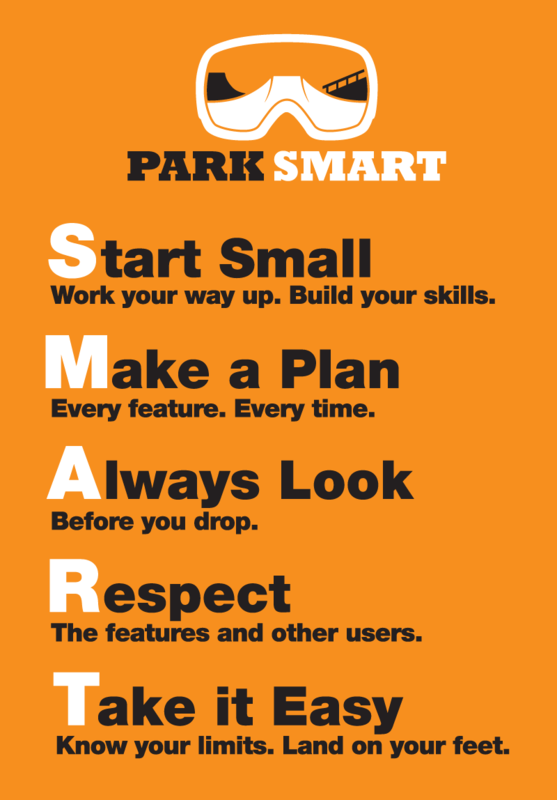 Park Smart represents five fundamental ideas that will help you and your friends have a better terrain park experience. Know them! Use them! 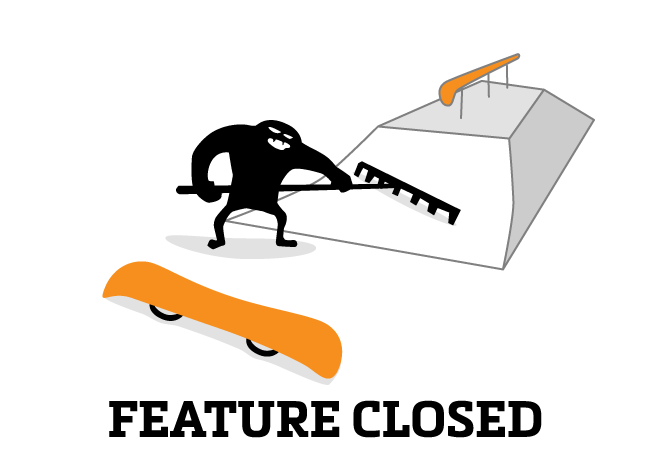 Features change constantly due to snow conditions, weather, usage, grooming, and time of day. Transitions are changes in shape and pitch of the snow or feature, or changes from one type of sliding surface to another. Transitions can be gentle or abrupt, and demand that users be alert and respond to them with accurate movements. Find the "sweet spot" on the landing, this is the area between the "knuckle" and center of the landing zone. Even if you land on or near the "sweet spot", you can still be seriously injured or die if your landing posture is not correct. Land on your feet! 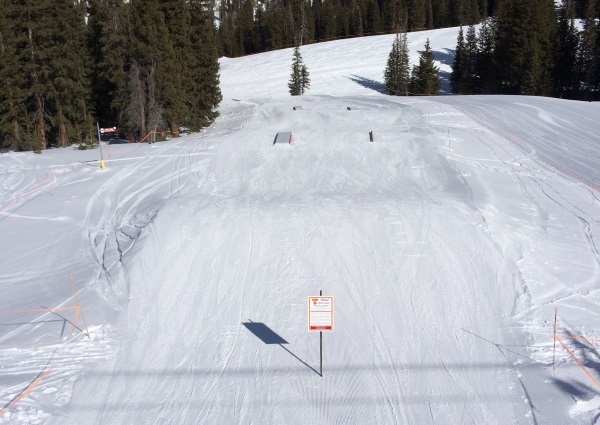 Some park features are designed for skiers and riders to be used in sequence, with no stopping between features. Others are designed with rest areas throughout where skiers and riders can stop and take a break. Jump features are designed and constructed for aerial maneuvers and reaching the landing zone. 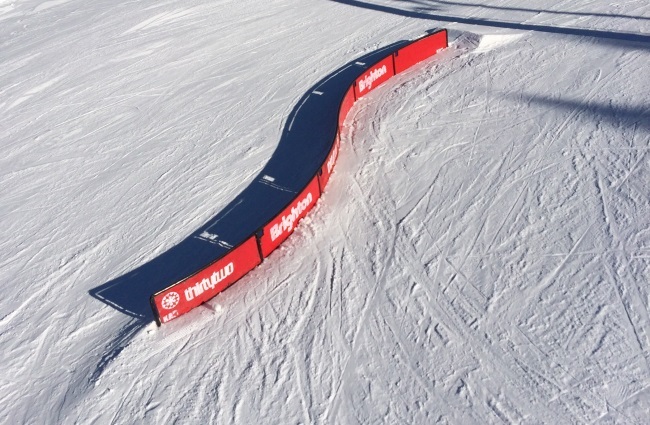 Rails and other jib features often have smaller takeoffs in front of them, designed to help you use the feature before going to the landing zone. Do not use rail takeoffs as jump features - it is not their intended use. 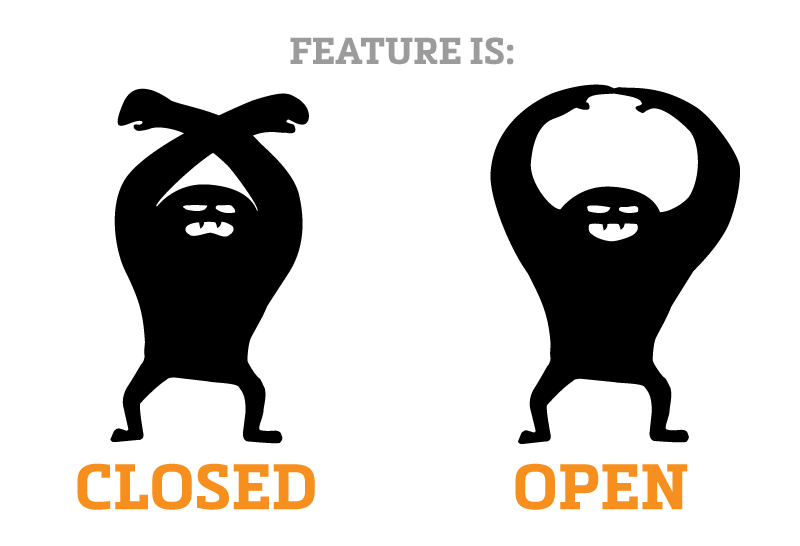 Each feature can be broken down into 4 zones. 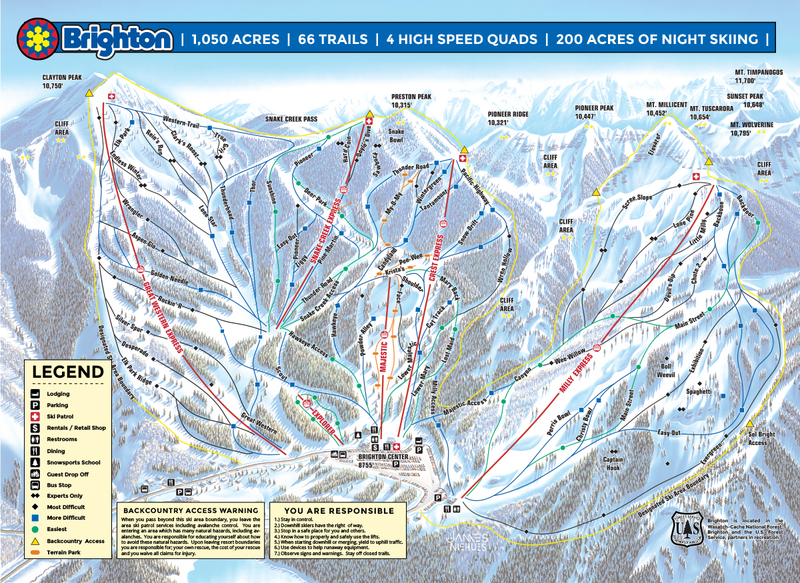 Identify those zones and have a plan before using any Freestyle Terrain. 1Approach Zone is the space for setting your speed and stance to use the feature. 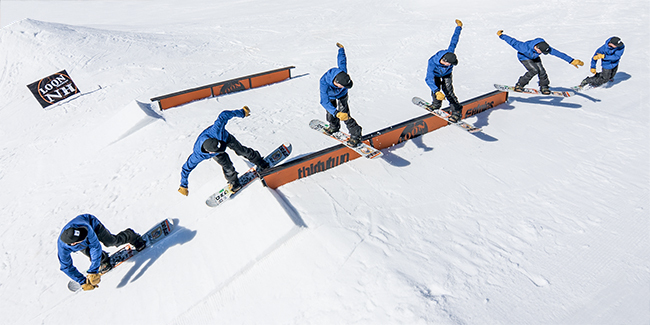 2Takeoff Zone is for making moves that start your trick. 3Maneuver Zone is for controlling your body in the air and setting up for landing. 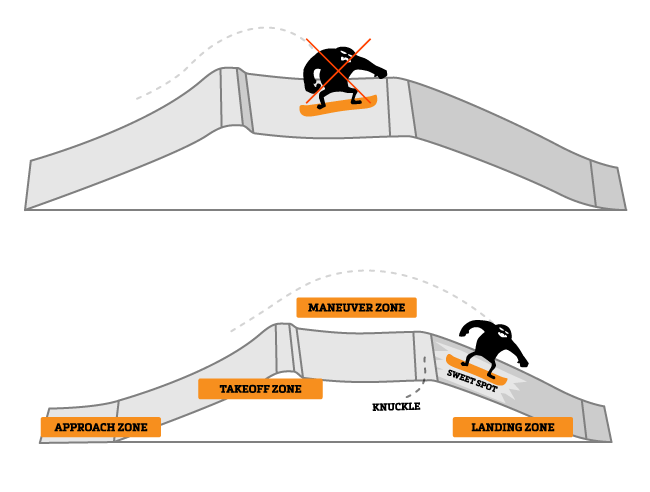 4Landing Zone is the prepared slope between the knuckle and the runout beyond it. Choose the answer from below that correctly describes "ATML". 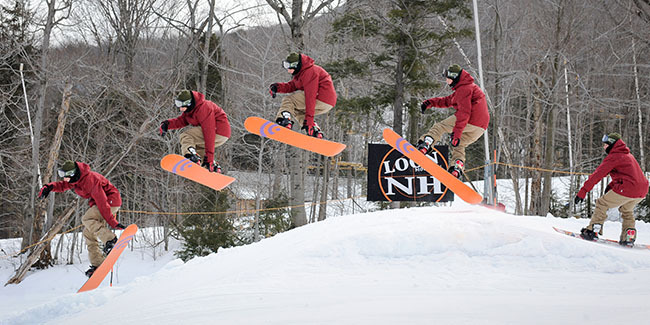 Use ATML as a mental checklist to help you figure out how to use terrain park features as safely as possible. Know your limits and your abilities! How much speed is too much? Are you positioned correctly? Are you lined up to do what you want to do? How do you end up on your feet and ride away from the feature? It is extremely important to have correct body positioning before leaving the takeoff. 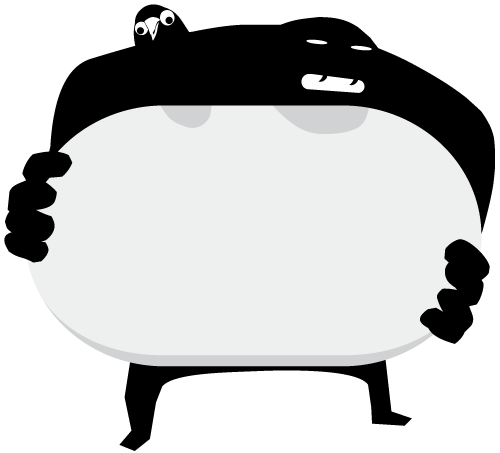 Being unbalanced may cause you to crash. 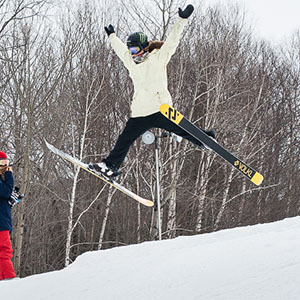 Leaning back on your skis or board, also known as "getting in the backseat" will most likely cause backward rotation. This is never good and could cause serious injury. Remember stay balanced on your equipment and land on your feet!! Stay balanced over your equipment! DO NOT lean back. DO NOT get in the backseat! Stay balanced over your feet. Be in control of your body and equipment. Know what different transition intensity feels like. Control your speed and know what speed you need. Again...stay balanced and DO NOT lean back!! DO NOT get in the backseat! Learn to control your body and equipment! 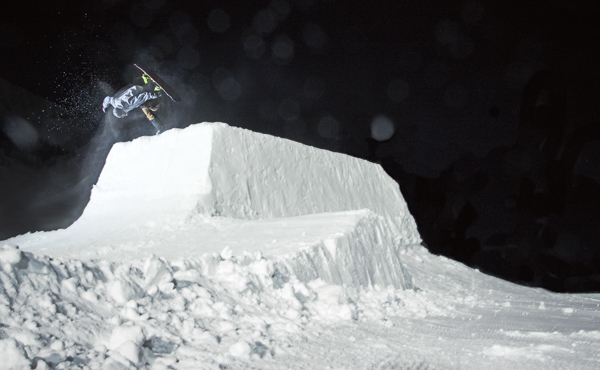 Terrain parks have a code of conduct, just like the rest of the mountain. Here, the PEEPs monster demonstrates some examples of park etiquette. Using and observing these simple rules and actions can help you understand what's happening below, inform other park users of your intentions and communicate with resort park staff. 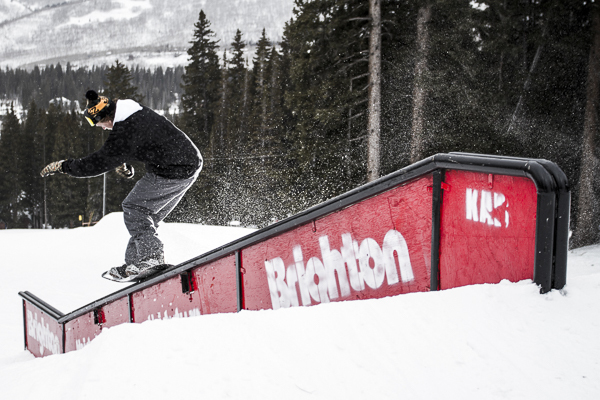 Abiding by this code and using it inside of any terrain park will help make your day more enjoyable. Wait your turn...no one likes being snaked! Park staff working hard! Give them some space! Use hand signals in the park...pay attention to others! Never stop on landings...it could ruin your day! We have emailed you a copy of your voucher as well. 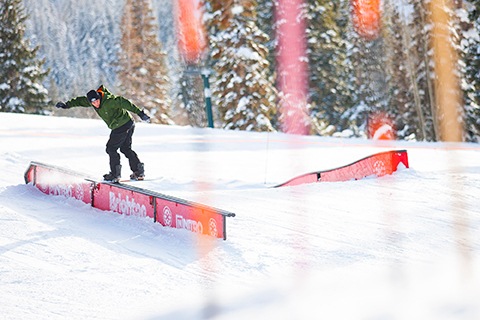 Brighton Resort is home to a full progression of award-winning terrain parks, with features for all ages and abilities. 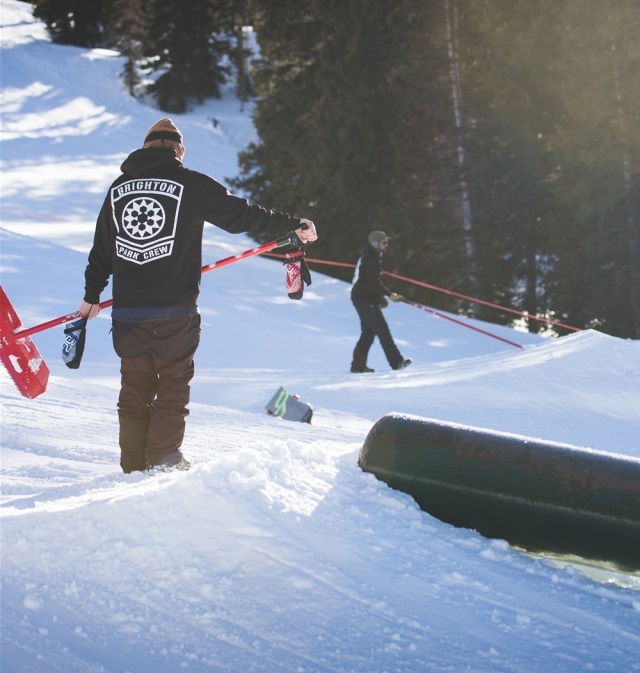 Visit Loon brightonresort.com to see which parks are open today. Looking for help... take a lesson. We have qualified coaches who will help you get to your goal.